Just got a Kindle DX in my hands about an hour ago and first impressions so far are quiet good. The first thing I did is load up a bunch of technical PDF documents (SDK’s) I have gathering on my desktop. I transferred them onto the Kindle DX via the USB cable and it mounted like an external drive. A simple drag and drop to the documents folder and unmount was all it took. All the PDF’s displayed on the main screen of the Kindle. The problem with the 6″ devices is that PDF support is not very good because of the eInk screen size. Scaling down a PDF makes it unreadable so the 9.7″ eInk display works out very good. Page flipping and search works and so far I’m quite impressed. 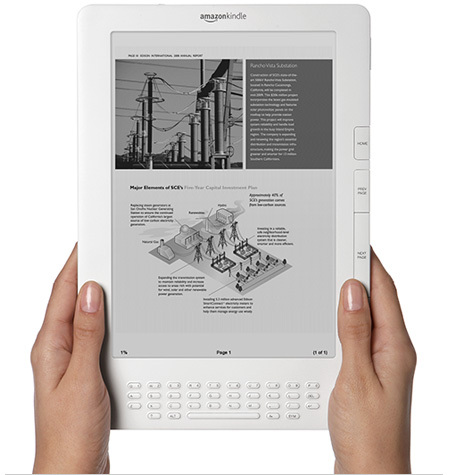 The cost of the Kindle DX is $489 which is very high compared to the 16gb Apple iPad. I would say the iPad will be a better device to store/read PDF’s as you don’t typically read them from cover to cover. At least I don’t, I typically reference SDK’s so using a iPad would work. The DX or other 9.7″ eInk devices costing $489 (or higher) may not be a viable products once the iPad is released.